As part of the Department of Home Affairs simplification of Australia's visa framework during recent years, there has been a number of significant changes in the temporary work visa space. It has been a tumultuous journey for immigration advisors and businesses who rely on the temporary work visa program to fill skill shortages. 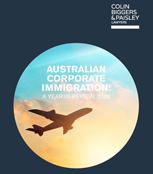 These significant changes led to the realignment and downsizing of who, what and how a skilled worker is classified for entry to, or stay, in Australia. The new Temporary Skills Shortage (TSS) program which replaced the old 457 visa, has resulted in a notable decline in visa applications for skilled workers. Many businesses have been significantly impacted by the removal of certain skilled occupations, stricter visa requirements, the implementation of the Skilling Australians Fund Nomination Training Contribution Charge and longer processing times. In this publication we provide an overview of the changes during 2018, highlight key trends and insights and outline how to prepare for what's next in 2019.